Developed from the F.ll, the Fokker F.lll had a fuselage of reduced length and increased width, with a cabin accommodating five passengers in upholstered comfort. The pilot was seated in an open cockpit offset to starboard, recessed into the wing leading edge. 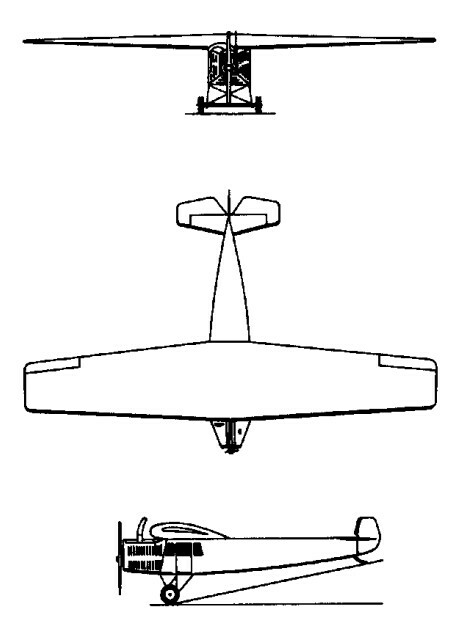 The thick-section monoplane wing was cantilevered, the fixed cross-axle landing gear had single-wheel units and compared to the F.ll, the rudder was of increased height. The prototype, powered by a 138kW BMW IIIa engine, was flown at Schwerin at the beginning of April 1921 and on 14 April inaugurated KLM flights for the year. The F.III was exhibited at the 1921 Paris Salon de I'Aeronautique where it met with a mixed reception as a result of Fokker's association with the German cause during World War I. Of 31 F.IIIs built by Fokker, 12 were supplied to KLM and these were powered by the 179kW Armstrong Siddeley Puma engine. They were used from 1921 linking Amsterdam, Rotterdam and Croydon, and also on the route from the Netherlands to Bremen and Hamburg. Other customers were the German Deutsche Luftreederei, which used a Danzig-registered machine with a BMW IIa engine; and the Hungarian MALERT company which operated four F.IIIs with BMW IIIas and two with 172kW Hiero engines, these being used from Budapest to Vienna and Graz. One F.III was demonstrated in North America, but only two aircraft were sold there. Later Fokker-built F.IIIs, powered by 268kW Rolls-Royce Eagle engines, had the pilot's cockpit offset to port and some were completed as strut-braced parasol-wing monoplanes. The Deruluft airline, owned jointly by the USSR and Germany, acquired 10 of these Eagle-powered F.IIIs, and two were taken into service by KLM in 1922. The latter were re-engined with 298kW Gnome-Rhone Jupiter VI radial engines in 1925 and used on the Amsterdam-Paris route. In 1926 five surviving F.IIIs were sold to the Swiss Balair company and made a formation delivery flight to Basle on 28 April. In 1923 production of the F.III began in Germany, at the Staaken works, the Deutsche Aero Lloyd airline acquiring at least 20 of these so-called Fokker-Grulich F.III aircraft. Some were powered by 186kW BMW IV engines, while others had Armstrong Siddeley Pumas. Several were re-engined subsequently with 239kW BMW Va engines, leading to the revised designation F.IIIc. When Deutsche Lufthansa was formed in 1926 it took over 16 F.IIIs then operating services between Hamburg and Amsterdam, and transferred them to short routes linking north German coastal resorts; they were later used on internal freight services. Two F.IIIs were sold to British Air Lines Ltd in 1929, a company then based at Croydon Airport.